01:44 Cylus How is the "freezemelt" property used in the game? By which I mean, how does the engine know when to swap the nodes? What trigger causes freezing and melting? 01:59 VanessaE it's not used anymore is it? 01:59 VanessaE wasn't that one of those finite water/weather properties? 02:45 Cylus VanessaE: Okay, cool. Thanks! I wonder why it's still in the API. 02:46 VanessaE I could be wrong, I don't know. 02:48 Cylus I can't tell what the code says for sure, but it doesn't seem to say much. It might be defining it, but then not even using it. 02:49 Cylus It's in three files. One header, one definition handler, and one tiny function that I'm not sure really does anything. 02:49 Cylus I figured it must do something because it was there, but if it's legacy cruft, that would explain it. 02:50 VanessaE yeah, if it's what I'm remembering, it's cruft. 02:50 Cylus "default:ice" also seems to be hard-coded into the engine, probably also as cruft. 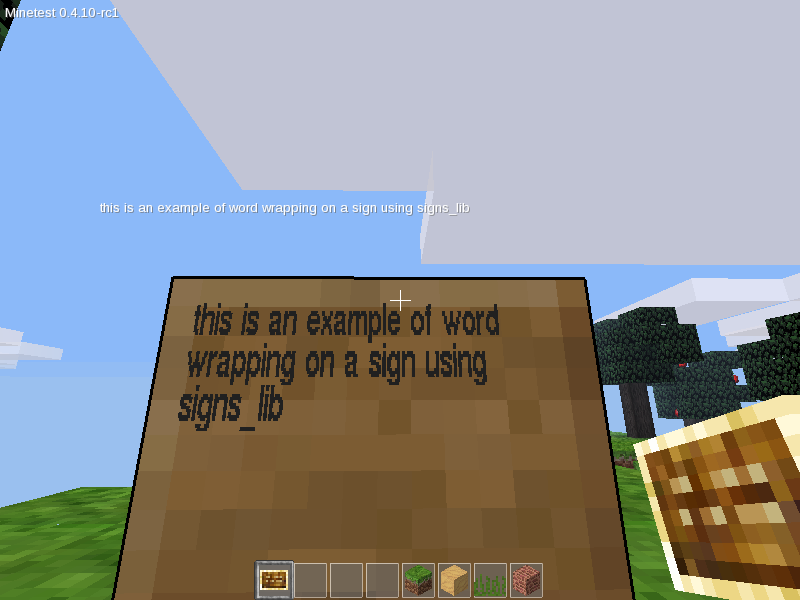 02:51 Cylus It's in minetest_game, but the proper way to define it in the engine would be as mapgen_ice, then alias it in default to default:ice. 02:51 Cylus And it looks like the engine looks up default:ice's node ID, then doesn't do anything with it. 02:52 * VanessaE checks issues..
02:52 Cylus Same with default:torch, but default:torch shows up in the legacy code too, so I ignore it. 02:53 VanessaE yeah, no node names should be hard-coded in the engine (except maybe air and 'ignore'). I agree there. 02:53 Cylus Okay, sweet. I can ignore it then. I need to check on some of these things so I can make sure my new game is properly coded. 02:54 Cylus I think it would be best to even use mapgen aliases for handling the legacy map conversions (I tested, and that *will* work), but I doubt I can convince the developers. 02:55 Cylus So I'm leaving that alone. 02:55 Cylus I think "unknown" is hard-coded, probably for good reason. But aside from those three, there's no reason to hard code any of them. 03:12 * Cylus considers building an "adams" mod, and including "adams:apple"
04:36 iio7 I don't get it. These last couple of days Bukkit/Craftbukkit has been shut down due to a DMCA. All kinds of projects are spawning a new rather than devs jumping to Minetest. 04:37 Cylus iio7: No one knows that we exist over here at Minetest. 04:37 iio7 It's a REAL shame! 04:37 iio7 So much wasted energy. 04:37 Cylus Yeah, wasted energy for sure. 04:38 Cylus Even if they wanted to do their own thing, our code would be a great starting point. 04:39 Cylus I drop mention of Minetest here and there, but I mostly hang out in the free world. The people there either know about Minetest already or otherwise don't play Minecraft. 04:39 iio7 I have tried this evening what I got was "Minetest isn't that this C++ thing?" and "Are you serious" etc. 04:42 Cylus VanessaE: Not sure if you care or not, but it seems that your nyan cat images, which are properly attributed to you in minetest_game, are not attributed to you in minetest/minimal. So ... I guess pull request if that's an issue. 04:44 Cylus Alright, just making sure. 04:56 gentoobro i can't seem to find it in the docs, but is there a way to make hollow cubes with the world edit mod? 05:08 blaise so, I turned on strict version checking.. and I only had a few people log in.. neither were my regulars..
05:08 blaise so I'm guessing they're not using the release version of minetest-0.4.10 ? 05:08 blaise did it get re-released? 05:08 blaise and I'm the odd ball? 05:16 iio7 I am just messing around with the cannon mod, anyone who knows how to fire? 05:16 VanessaE never used it. maybe punch it with a torch? 05:27 Cylus gentoobro: Those are just cubic entities. Look for the part of the docs dealing with entity definitions, and choose a cubic entity. 05:28 VanessaE Cylus: I think he means the shape primitives. 05:29 Cylus gentoobro, VanessaE: Oops, my bad. Ignore my statement. 05:29 VanessaE interesting that there is no primitive for that function. Easy enough to replicate with two //set commands though. 05:40 blaise I'm highly interested in that project..
10:32 TenPlus1 Q: Does the explody = 1 group actually DO anything ??? 10:48 basse hi, i'm having some issues setting up a server. it works fine inside local network, but when i try to join from outside i get blank world .. or not even that sometimes. 10:48 TenPlus1 how do you mean ? you connect to an empty world ? or just do not connect to anything ? 10:49 basse Megaf_ suggested i try here for help.. if it is just upload bandwidth problem and can be configured. 10:49 basse TenPlus1: it connects, and it starts uploading (according to server) but nothing comes up to client..
10:50 TenPlus1 is it a basic world or do you have loads of mods ? 10:50 basse this is basic world. 10:51 TenPlus1 using the exact same user name and pass ?? 10:53 TenPlus1 basse: when connecting through internet are you using the same pc ? 10:54 basse hmm yes i guess so... have to try to tweak the settigs on server side..
10:58 basse Jordach: yes, i noticed too that sometimes i can't get in at all, sometimes i get this blank thing..
10:58 basse once i got the world. 11:10 kaeza TenPlus1, ok, also, can you paste the text as you entered into the formspec here? 11:12 basse thing is, if it's upload bandwidth related (this looks a bit like that) is there way to control that? 11:13 basse minetest takes so much more bandwidth? 12:47 john_minetest MMDB should be integrated much more into everything. 12:49 john_minetest We should have a fancy mod db, a fancy game db and a UBER-FANCY server list with blinking gif banners and sfx. 12:49 rubenwardy I assume you are joking. 12:53 john_minetest Man, windows XP allowed me to set gif backgrounds. We had computer stuff in school. We drove our teacher crazy. 13:35 john_minetest The server list needs banners and sorting and icons for the flags. "Ded Dmg PvP Pwd Rol Far"... I know that it is Dedicated, Damage enabled, PvP, Password required. But "Rol" and "Far"? 13:35 john_minetest Rollback and Farming? 13:37 john_minetest Why is this important? 14:14 * Jordach plays "there is only room for one render topic in the forums card"
14:29 CraigyDavi`` Could one of the forum moderators give me the email address of a user...or is that not possible? 14:31 CraigyDavi`` Is that a yes or no? 15:01 sfan5 PenguinDad: whats that? 15:02 NekoGloop so how goes development over the summer? anything interesting added? 15:03 NekoGloop I'm still banned in #minecraft, lol. 15:09 VanessaE NekoGloop: in addition to that ^^^^ many mods have seen improvements too. 15:14 sfan5 anyone here heard of https://tox.im ? 15:15 john_minetest It is quite nice but you need a seperate account for every computer/device you have. 15:15 john_minetest You can't export the accounts as you would do it with PGP keys. 15:16 sfan5 john_minetest> You can't export the accounts as you would do it with PGP keys. 15:16 john_minetest uTox is nice. 15:19 sfan5 Jordach: y u not come online? 15:21 VanessaE play around with it a bit. 15:51 YuGiOhJCJ hello, when I write letters that are not ASCII letters in the Minetest chat (or in the "Sign" object), they are not written. I am using Minetest 0.4.10 (Linux). It seems to work good on the Windows version. Is there a way to resolve this bug? 15:53 VanessaE YuGiOhJCJ: install freetype and gettext. 15:53 VanessaE and recompile against those. 15:56 JTE_ Lua 5.3 is great. Can't wait for that to be finalized. 15:57 VanessaE JTE_: that will probably be a VERY long time in coming. 17:28 VanessaE Calinou: no worries. 17:47 Krock It's a take-away hand. Isn't it? 17:47 Corvus` Is there a reason why planks, trees and cobble do not show the texture in the inventory? 17:48 Krock PenguinDad, nvm. I was able to give it to someone else. 17:50 john_minetest Corvus`: Describe your problem further, please. Operating system, minetest version and an exact description. 17:50 john_minetest Is anything else missing? Are strange patterns appearing in the inventory? 17:54 PenguinDad Corvus`: does it work without any texture pack? 17:54 Calinou what's your graphics card? 17:55 Corvus` I'm quite old myself. 18:04 Krock hai, haven't seen you a while. Almost missd ya. 18:08 Krock so. new talking stuff is needed. 18:10 SaltyDog001 Good day all :) Any easy way to add privs to the auth.txt file? I added a mod and need additional priv now. 18:13 SaltyDog001 I have many users already and need to somehow add a new priv to all these users. New users will have the additional priv. Maybe sometype of macro to edit the auth.txt file. 18:13 SaltyDog001 Sorry, did not express myself well. 18:13 Krock and default_privs doesn't affect already registered users? 18:13 SaltyDog001 i added the new priv and it doesn not modify the auth.txt file. 18:14 SaltyDog001 ok is that admin command in game? 18:14 VanessaE that's a command you can run in your shell. 18:15 Krock How I would do it: replace "\n" with ",<yourpriv>\n" and replace ":," with ":"
18:18 Krock PenguinDad, "cool" starts with a 'c' and and with a 'l'. 18:21 Krock sry. I like your nickname. 18:41 Krock eww no. http://imgur.com/gallery/LsyfST4 how evil. 18:46 john_minetest Lol, who uses chrome? 18:46 john_minetest I don't think that it is even in the repo. 18:47 john_minetest Yep. Chrome isn't even in the archlinux repos. 18:47 john_minetest At least not in the official one. But chromium is in the official repo. 18:47 john_minetest And firefox ftw. 18:53 john_minetest I write wiki entrys and similar outside of the browser. You never know when you accidently refresh the page. 19:18 luizrpgluiz anyone here done or are doing some mod world generator? 20:21 jordan4ibanez is technic done? 20:33 jordan4ibanez is there a magic mod? 20:34 VanessaE no idea, rather. 20:35 jordan4ibanez Is there block friction yet? 20:37 jordan4ibanez Is there anything like rotarycraft from MC yet? 20:37 VanessaE which does what? 20:38 VanessaE I don't know if such a thing exists but that should be doable I would think. 20:38 jordan4ibanez Can we have custom meshes for blocks yet? 20:38 VanessaE no, not yet. 20:39 jordan4ibanez Oh really? May you show me? 20:39 jordan4ibanez And is this an api? 20:39 VanessaE it's not an API function. 20:46 jordan4ibanez RealBadAngel: did you use that cannon thing I made? 21:01 jordan4ibanez is there a way to get the block that the player is pointing at? 21:03 VanessaE e.g. on_punch, after_dig_node, etc. 21:18 john_minetest Haven't seen you for some time. 22:34 sharky_ hello ,i hvae one question ,how can i activate tnt in minetest 0.4.10 ? 22:44 VanessaE I assigned to to nore. that's his thing. 22:45 VanessaE he maintains the item transport logic in pipeworks. 22:51 Megaf Jeija, Are you here? 22:51 VanessaE he's not usually here. 22:53 jordan4ibanez Well how do I change the hud element text?? 22:54 VanessaE Megaf: I dunno if that mod still works. I've never used it. 22:58 VanessaE give it a try and see. 22:58 blaise my wife said she needed my help with understanding covalent bonding.. so I took a large plate and four small plates to represent carbon, and 4 hydrogen.. apples and d-cell batteries for electrons..
22:59 blaise I believe I might be in a very bad situation..
23:00 zat Megaf: why not just opening the image rather than a preview? 23:30 jordan4ibanez celeron55, is there a way to get pointed thing on global step? 23:30 jordan4ibanez I tried minetest.get_pointed_thing_position(pointed_thing, above), but that didn't work, then I hacked together some ridiculous method to get the pointed thing, but it doesn't do corners very well. 23:59 jordan4ibanez I did. Do you know how to get pointed thing on world step?